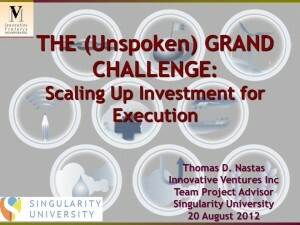 Every Summer Singularity University (SU) conducts the 10 week Graduate Studies Program (GSP) which challenges future leaders and entrepreneurs to tackle widespread global problems with innovative team-based technology solutions. Many of the teams develop projects which are commercialized in both developed and emerging market countries. This is my 2nd year as a team project advisor, mentoring GSP participants in selecting business models and the raising of $$. Big thanks to Sandy Miller (Co-Chair Entrepreneurship / Managing Director, New Venture Development) and Nicholas Haan (Director of Global Grand Challenges/team project leader) for the invitation to return to SU. 2) The culture of risk and failure in emerging markets impacts investor DNA—what they finance and what they won’t—much differently in emerging markets vs. the USA. So the issue for emerging market entrepreneurs and the ecosystem is: how does one raise $ for your venture and how does one create a start-up community under such circumstances? It is these topics which I’ll mentor GSP entrepreneurs. Some of the topics for this week I spoke about in 2102 at SU, click the icon below to open the PPT.